A young woman, Brenda, was found to have essentially no urinary iodine excretion, indicating iodine deficiency. Although she had been in the US for twenty years, she was born and grew up in a foreign country noted for low iodine levels. Because of iodine deficiency, Brenda began a program of iodine supplementation with iodized salt. About a week later, Brenda experienced an episode of severe Rapid heart rate, called tachycardia, with a sustained pulse rate of 220 beats per minute. She was taken to the local hospital Emergency Room, where the doctors had no explanation for the tachycardia which resolved spontaneously shortly after arrival. She was sent home with a Beta-Blocker Drug, called Atenolol. Above left image: Autonomous Thyroid Nodule on Radionuclide Thyroid scan (black arrow), also called a “Hot Nodule” courtesy of wikimedia commons. What Caused Brenda’s Tachycardia ? The Autonomous Nodule. Brenda’s tachycardia was a manifestation of hyperthyroidism from an autonomous thyroid nodule. When Brenda started her iodized salt, her iodine supplements, the increased iodine available to the thyroid nodule was converted to thyroid hormone. This is a well described phenomenon of hyperthyroidism associated with an increase in dietary Iodine caused by autonomous thyroid nodule. An episode of hyperthyroidism after iodine ingestion is most commonly associated with an autonomous thyroid nodule that manufactures thyroid hormone, and is independent of the normal control mechanism, which is the TSH (thyroid stimulating hormone) of the pituitary gland. Brenda was advised to stop the dietary Iodine and sent for diagnostic evaluation for an autonomous thyroid nodule, also called a “hot nodule”. Sure enough, Brenda’s thyroid sonogram showed a thyroid nodule in the right upper lobe, and her Technesium 99M radionuclide scan showed that the nodule took up the tracer avidly, and was a “Hot Nodule”, indicating an autonomous nodule. In some cases, the nodule uptake may not be increased or “Hot” compared to the surrounding normal thyroid gland, and an additional step with a repeat scan after giving the patient Thyroxine (called a Thyroxine suppression test) may be needed to show increased uptake in the autonomous nodule. The Thyroxine suppresses uptake in the normal thyroid gland, yet does not reduce the uptake in the autonomous hot nodule, allowing visibility on the uptake scan. What is an Autonomous Nodule? Recent medical research reveals that autonomous thyroid nodules are clones of cells that have a mutation in the TSH receptor (Thyroid Stimulating Hormone Receptor). (9) These mutations usually arise as a result of iodine deficiency in patients who spend their childhood in iodine deficient regions. The mutations make these nodules independent of TSH control usually found in normal thyroid tissue. The nodules make thyroid hormone uncontrollably based on the availability of Iodine. Even small amounts of iodine supplements normally found in Iodized Salt can cause transient hyperthyroidism in patients with autonomous nodules. (1-7) This increased prevalence of hyperthyroidism was reported with the introduction of Iodized Salt and Iodized Bread programs to prevent iodine deficiency in various countries including the US. In addition, iodinated radiographic contrast (such as used for a CAT scan) can also cause transient hyperthyroidism in susceptible patients with autonomous nodules. 3) Surgical removal of the nodule with thyroid lobectomy procedure. Serum thyroglobulin is also useful in evaluating Iodine status. Luckily, autonomous nodules are quite rare in the US after iodine supplementation to table salt in 1924. However, when people migrate to the United States after growing up in an iodine deficient region, these people may harbor autonomous nodules and may present with features of transient hyperthyroidism when supplemented with iodine in the diet. Iodine deficiency is a risk factor for mutations in the TSH receptors and development of the autonomous thyroid nodule. Although universal salt iodization has been used as the most effective method of providing iodine sup-plementation, in areas where salt iodization program has failed, or when iodized salt is not widely avail-able, iodized oil can be used for iodine supplemen-tation. Following administration of iodized oil, iodine is continuously released from the lipid stores over long periods of time. The effect may last for one year after oral and up to 3-7 years after intramuscular administration, helping to prevent endemic goiter, physical and psychomotor retardation, and the un-desirable pre- and postnatal complications of iodine deficiency. Iodized oil administration decreases the size of goiter, reverses hypothyroidism, improves psychomotor performance and corrects auditory dis-turbances caused by iodine deficiency. Derma-tologic complications, iodine induced hyperthyroid-ism and hypothyroidism may occur following its use, but enhancement of thyroid autoimmunity and thyroiditis have rarely been reported. The use of iodized oil during pregnancy has no deleterious effects on the thyroid function of the offspring. Bull N Y Acad Med. 1976 September; 52(7): 770–781. Kohn LA. The Midwestern American “epidemic” of iodine-induced hyperthyroidism in the 1920s. Bull N Y Acad Med 1976; 52: 770-81. Connolly RJ, Vidor GI, Stewart JC. Increase in thyrotoxicosis in endemic goitre area after iodation of bread. Lancet 1970; 1: 500-2. Vidor GI, Stewart JC, Wall JR, Wangel A, Hetzel BS. Pathogenesis of iodine-induced thyrotoxicosis: studies in northern Tasmania. Eur J Endocrinol 1995; 132: 546-9. Todd CH, Allain T, Goma ZATC, Hasler JA, Ndiweni M, Oken E. Increase in thyrotoxicosis associated with iodine supplements in Zimbabwe. Lancet 1995; 346: 1563-6. Bourdoux PP, Ermans AM, Mukalay wa Mukalay A, Filetti S, Vigneri R. Iodine-induced thyrotoxicosis in Kivu, Zaire. Thyroid 1999; 9: 545-56. Delange F, de Benoist B, Alnwick D.
Risks of iodine-induced hyperthyroidism after correction of iodine deficiency by iodized salt. Clin Endocrinol (Oxf). 1977 Aug;7(2):121-7. The toxic effect of small iodine supplements in patients with autonomous thyroid nodules. Livadas DP, Koutras DA, Souvatzoglou A, Beckers C.
In sixteen cases of toxic adenoma of the thyroid (autonomous hot nodule with complete suppression of the surrounding normal parenchyma) potassium iodide was given in doses of 100 microgram/day for one week, 200 microgram/day for another and 400 microgram/day for a third week. There was a progressive increase in the serum T4 level. Serum T3 also increased, although this was significant only after the first week. Serum TSH was undetectable throughout the entire period of the study. This metabolic pattern is different from the response seen in cases of nontoxic endemic goitre, where small iodine supplements induce an increase in serum T4 but a decrease in serum T3. Furthermore, the present results may explain the phenomenon of iodine-induced or iodine-precipitated hyperthyroidism (Jod-Basedow) when patients with autonomous thyroid are presented with a high iodine intake. In contrast to the results obtained with small iodide doses, two other cases treated with large pharmacological doses of iodide showed a decrease in both serum T4 and serum T3. It is concluded that the physician should be aware of the possibility of precipitating or aggravating thyrotoxicosis in patients with an autonomous hot nodule by increasing their intake of iodine. When the iodine supply is low, the thyroid compensates by a number of mechanisms in an attempt to maintain sufficient thyroid hormone production (4). These compensatory mechanisms, over the years, may trigger development of multifocal autonomous growth and function of the thyroid gland with scattered cell clones harboring activating mutations of the TSH receptor (5, 6). As a consequence, mild and moderate ID is associated with a high incidence and prevalence of multinodular goiter and nodular hyperthyroidism, especially in middle-aged and elderly females (7, 8). One of the main complications observed after initiation of iodine prophylaxis is iodine-induced hyperthyroidism (IIH), which has been reported in many iodine supplementation programs (9, 10). IIH seems to occur primarily in older subjects with autonomous thyroid nodules caused by longstanding low iodine intake. When the autonomous nodules are supplied with more substrate, as in iodine supplementation, the synthesis of thyroid hormones may exceed the physiological need, and a hyperthyroid condition develops. IIH may also occur in younger subjects whose autoimmune hyperthyroidism [Graves’ disease (GD)] has not been expressed because of ID (10). Voluntary iodine fortification (IF) of salt was introduced in Denmark in June 1998. At baseline, the crude incidence rate of hyperthyroidism in the entire Aalborg + Copenhagen cohort was 102.8/100,000/year. The incidence rate increased during voluntary IF to 122.8/100,000/year (P < 0.001) and further during early mandatory IF to 140.7/100,000/year (P < 0.001) before it became stable at a level about 35% above baseline. In conclusion, we found that even a cautious iodization of salt resulted in an increase in the incidence rate of hyperthyroidism. J Clin Invest. 2005 August 1; 115(8): 1972–1983. Hulya Iliksu Gozu1,*, Rifat Bircan4,*, Knut Krohn5, Sandra Müller6, Selahattin Vural2, Cem Gezen2, Haluk Sargin1, Dilek Yavuzer3, Mehmet Sargin1, Beyazit Cirakoglu4 and Ralf Paschke6 this study demonstrates that the frequency of somatic TSHR mutations in hot nodules is actually high in Turkey without a significant difference between iodine-deficient and -sufficient regions. !!!!!!!!!!!!!!!!!! Most recent and BEST !!!! 15) www.japi.org/thyroid_special_jan_issue_2011/facts%20of%20iodine.pdf Thyroglobulin Tg is synthesized only in the thyroid and is the most abundant intra thyroidal protein. In iodine sufficiency, small amounts of Tg are secreted into the circulation, and serum Tg is normally less than 10 μg/l. In areas of endemic goitre, serum Tg increases due to greater thyroid cell mass and TSH stimulation. • Minimum daily intake of 100 μg iodine is essential to eliminate all signs of iodine deficiency, though the daily requirement varies between different age groups. • The effects of iodine deficiency on the development of goitre and thyroid hypo function are extremely variable among populations and individuals, even in endemic areas. • Four methods are generally recommended for assessment of iodine nutrition in populations: urinary iodine concentration (UI), the goitre rate, serum TSH, and serum Tg. • Thyroid gland palpation and thyroid ultrasonographic examination are used to assess thyroid enlargement. Pol Merkur Lekarski. 2006 Feb;20(116):164-7. [Thyroglobulin concentration after introduction of population iodine prophylaxis in random selected group of children and adolescents in Szczecin region]. [Article in Polish] Brodowski J, Kozielec T, Karakiewicz B, Durska G, Kedzierska E. Source Pomorska Akademia Medyczna w Szczecinie, Samodzielna Pracownia Pielegniarstwa Rodzinnego Katedry Medycyny Rodzinnej. Abstract The analysis from the early 1990s showed the iodine deficiency and endemic goitre in whole country. These studies contributed to introduce in 1997 the obligatory model of iodization the table salt. The risk connected with iodine deficiency causes that the monitoring of iodine balance became a very important thing. One of the most important indicators is thyreoglobulin serum concentration. Aim of the study was determination of thyreoglobulin serum concentration as an assessment the efficacy of current model of iodine prophylaxis in random selected group of children and adolescents in Szczecin region. MATERIAL AND METHODS: The study was undertaken in the years 2003-2004. In random selected group of children and adolescents in Szczecin region. The patients administered vitamins or minerals enriched with iodine were excluded from a study. The study included 151 persons aged 9 to 16 years, 80 boys (53%) and 71 girls (47%). Radioimmunometric and radioimmunological methods were used for the determination of thyreoglobulin (Tg) and thyrotropin (TSH) and free thyroxine (FTJ concentrations. Iodine excretion with urine was determined on the basis of catalytic Sandell-Kolthoff reaction. Collected data were then analyzed using sophisticated computer-based statistic program. RESULTS: In whole study group mean Tg concentration was 11.97 +/- 7.57 ng/ml. In 69 persons (45%) they were normal, in 82 (55%) were increased: 67 (44%) of them has insignificant increase (low iodine deficiency) and in 15 (11%) were in a range 20-40 ng/ml, what is connected with a mean iodine deficiency. In whole study group mean FT4 concentration was 15.59 +/- 4.72 pmol/l. In a group with normal thyreoglobulin concentrations mean FT4 was 17.69 +/- 4.53 pmol/l and was significantly higher than in a group with insignificant and mean Tg increase and were 15.36 +/- 4.43 pmol/l and 13.72 +/- 4.63 pmol/l, respectively. Mean TSH concentration was 2.23 +/- 0.9 microU/ml and mean iodine concentration was 87.2 +/- 37.5 microg/l. Between TSH serum concentrations and ioduria were no significant differences between the groups. There was significant correlation between thyreoglobulin concentration and FT4 (r(s) = -0.24) and thyrotropin (r(s) = 0.21). 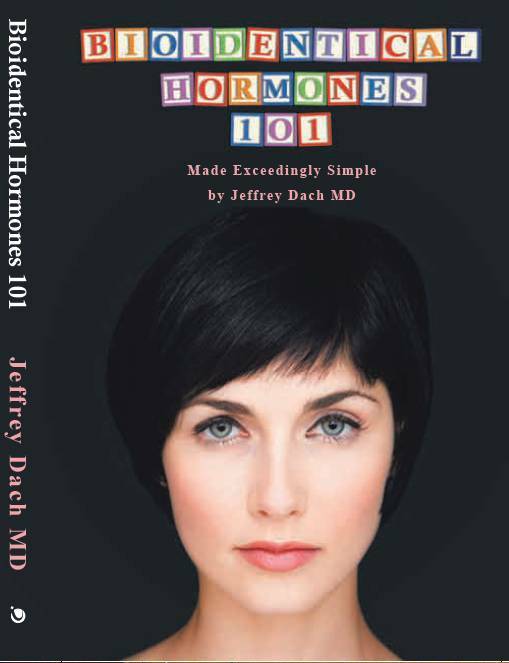 No correlation was found between concentration of these hormones and ioduria. Similarly, there was no correlation between thyreoglobulin concentration and iodine urinary excretion. CONCLUSIONS: Thyreoglobulin serum concentrations evaluated during the study revealed iodine deficiency in Szczecin region. Correlations between thyreoglobulin concentrations, free thyroxine and thyrotropin make a Tg determination to be more helpful indicator of iodine balance than ioduria. Serum Tg and urinary iodine concentration were the most appropriate indicators for measuring change in iodine status in this population. Thus both urinary iodine concentration and Tg are independent measures of iodine supply to the body. Unfortunately, there is great interlaboratory variation in the measurement of serum Tg concentration. At the present time, cut-off values are based on values obtained in individual laboratories. Therefore, it will be necessary for methods for estimating serum Tg concentration to be standardized before they can be applied widely in monitoring iodine status in programs to control iodine deficiency. Eur J Endocrinol June 25, 2009. Results: Before iodization the median serum thyroglobulin was considerably higher in moderate than in mild iodine deficiency. Iodization led to a lower serum thyroglobulin in all examined age groups. The marked pre-iodization difference in thyroglobulin level between the regions was eliminated. The prevalence of thyroglobulin above the suggested reference limit (40 μg/l) decreased from 11.3% to 3.7% (p<0.0001). Using bootstrapping, we demonstrated a higher efficacy of thyroglobulin than of thyroid volume to show a difference between pre- and post iodization values. Conclusion: We found serum thyroglobulin to be a suitable marker of iodine nutrition status in the population. The results may suggest that the Danish iodization programme has led to a sufficient iodine intake, even if the median urinary iodine excretion is still marginally low according to WHO criteria. Public Health Nutr. 2007 Aug;10(8):799-802. Epub 2007 Feb 27. Increased prevalence of hyperthyroidism as an early and transient side-effect of implementing iodine prophylaxis. Gołkowski F, Buziak-Bereza M, Trofimiuk M, Bałdys-Waligórska A, Szybiński Z, Huszno B. Source Department of Endocrinology, Jagiellonian University Faculty of Medicine, Kopernika 17, 31-501 Krakow, Poland. OBJECTIVE: To assess the prevalence of hyperthyroidism just after implementation of iodine prophylaxis among adults from an area with iodine deficiency. STUDY DESIGN AND SUBJECTS: A total of 1648 adults (age 16 years and older) were sampled from an area of southern Poland during two nationwide epidemiological surveys. Of these, 1424 adults with negative medical history for thyroid disorders qualified for final analysis. The authors compared thyroid dysfunction in participants prior to (1989-1990) and after implementation of iodine prophylaxis (1997-1999). SETTING: The southern part of Poland. RESULTS: We found an increase in the serum concentration of anti-thyroid microsomal antibodies from 4.9% in the years 1989-1990 to 12.1% after introduction of iodised household salt (P < 0.0001). The prevalence of hyperthyroidism (defined as thyroid-stimulating hormone < 0.4 microU ml- 1) significantly increased in the equivalent period from 4.8 to 6.5% (P = 0.009). CONCLUSIONS: We concluded that a sudden rise in iodine intake after implementation of iodine prophylaxis among adults from the area with iodine deficiency may lead to an increase in thyroid autoimmunity and prevalence of hyperthyroidism. Those possible early side-effects appear to be only temporary and are acceptable when compared with the evident benefits of adequate iodine intake. Iodine-induced hyperthyroidism: occurrence and epidemiology. Stanbury JB, Ermans AE, Bourdoux P, Todd C, Oken E, Tonglet R, Vidor G, Braverman LE, Medeiros-Neto G. Source International Council for the Control of Iodine Deficiency Disorders, Chestnut Hill, Massachusetts USA. Abstract We have critically reviewed the available information on iodine-induced hyperthyroidism (IIH) from published sources and other reports as well as the experience of the authors in Tasmania, Zaire, Zimbabwe, and Brazil. Administration of iodine in almost any chemical form may induce an episode of thyrotoxicosis (IIH). This has been observed in epidemic incidence in several countries when iodine has been given as prophylaxis in a variety of vehicles, but the attack rate as recorded has been low. IIH is most commonly encountered in older persons with long standing nodular goiter and in regions of chronic iodine deficiency, but instances in the young have been recorded. It customarily occurs after an incremental rise in mean iodine intake in the course of programs for the prevention of iodine deficiency, or when iodine-containing drugs such as radiocontrast media or amiodarone are administered. The biological basis for IIH appears most often to be mutational events in thyroid cells that lead to autonomy of function. When the mass of cells with such an event becomes sufficient and iodine supply is increased, the subject may become thyrotoxic. These changes may occur in localized foci within the gland or in the process of nodule formation. IIH may also occur with an increase in iodine intake in those whose hyperthyroidism (Graves’ disease) is not expressed because of iodine deficiency. The risks of IIH are principally to the elderly who may have heart disease, and to those who live in regions where there is limited access to medical care. More information is needed on the long-term health impact of IIH or “subclinical” IIH, especially in the course of prophylaxis programs with iodized salt or iodinated oil in regions where access to health care is limited. Corvilain B, Van Sande J, Dumont JE, Bourdoux P, Ermans AM. Source Institute of Interdisciplinary Research, School of Medicine, University of Brussels, Belgium. The occurrence of hyperthyroidism in many individuals after introduction of iodine prophylaxis in endemic goiter areas can have dramatic consequences for the affected individuals. It indicates that in such individuals the increase of serum thyroid hormone level in response to iodine supplementation does not exert its normal negative feedback on thyroid activity, ie, that in such individuals some thyroid tissue has become autonomous. In this short review we summarize what is known about the possible mechanisms, cause, diagnosis, and consequences of thyroid autonomy. Fortschr Med. 1982 Feb 4;100(5):153-8. The occurrence of multiple processes in elderly patients brings a high risk for diagnostic or therapeutic induced iodine-hyperthyroidism. Often an atypical form of hyperthyroidism without classical symptoms is induced. The cause of iodine-induced hyperthyroidism exists mostly in autonomous tissue beyond a “critical volume” in localized or disseminated form. If the deficiency of iodine in endemic goitre areas is substituted by iodine-application, hypermetabolism of autonomous tissue causes hyperthyroidism. The pathomechanism of autonomy and iodine-induced hyperthyroidism is not completely known. General iodine salt prophylaxis will bring less amounts of autonomous goitres. Some differential diagnostic possibilities for avoiding iodine-contamination in the elderly patients and therapeutic consequences after unavoidable iodine-application are described. Autonomously functioning thyroid tissue (AFTT) of the circumscribed as well as the disseminated form was found with equal frequency and extent in eumetabolic patients under and over 40 years of age who live in an endemic goitre area. In an area of iodine deficiency this is the most frequent precondition for hyperthyroidism induced by iodine administration. A suspicion of AFTT can be raised in 80% of still euthyroid patients by a combined evaluation of an equivalent to the free T4 (FTE) and an equivalent to the clearance using a quantitative evaluation of the thyroid technetium scan (TcTU). The suppression test not only confirms the autonomy in a qualitative manner but also provides an estimate of the volume of autonomous tissue because the TcTU after suppression strictly correlates linearly with the volume of the AFTT. Since after iodine administration FTE increases proportionally to the volume of AFTT, the procedure can be of some prognostic value: those with autonomous tissue in excess of a “critical” volume will almost certainly develop hyperthyroidism following a certain minimum rate of iodine administration. A prospective study of patients under age 50 whose thyroids contained various amounts of AFTT has shown that prophylactic dietary iodine supplementation will not cause hyperthyroidism to develop provided the additional iodine intake does not exceed 100 micrograms per day. The risk of iodine-induced thyrotoxicosis in euthyroid patients receiving iodine-containing contrast agents is known to be low, but data on this risk in patients with latent hyperthyroidism are scarce. We investigated the role of thyroid scintigraphy using Tc-99m preceding the application of iodine-containing contrast material to estimate the risk of iodine-induced thyrotoxicosis in patients with low levels of TSH. In a prospective study on 91 patients, thyroid scintigraphy was performed before coronary angiography (CA). In patients with technetium thyroid uptake (TCTU) less than 1%, CA was done without prophylactic drugs (n = 56). Patients with TCTU greater than 1% were treated either with 900 mg of perchlorate or, depending on the autonomous volume, combined with 20 to 60 mg thiamazole. In the 56 patients with TCTU less than 1%, no case of iodine-induced hyperthyroidism occurred within 4 wk after CA. In the patients who received prophylactic drugs, two cases of mild thyrotoxicosis were observed. Our data suggest that in patients with low levels of TSH, the risk of hyperthyroidism after application of iodine-containing contrast media is negligible if TCTU is less than 1%. In these patients, CA can be performed without administration of prophylactic drugs. Clin Endocrinol (Oxf). 2000 Apr;52(4):471-7. Thyroid suppression test with L-thyroxine and [99mTc] pertechnetate. Ramos CD, Zantut-Wittmann DE, Tambascia MA, Assumpção L, Etchebehere EC, Camargo EE. Source Division of Nuclear Medicine, Department of Radiology, School of Medical Sciences, Campinas State University, Campinas, Brazil. 3 with nonautoimmune diffuse toxic goitre. Baseline thyroid uptake and imaging were begun 20 minutes after an intravenous injection of 370 MBq (10 mCi) of [99 mTc] pertechnetate. This was followed by a single daily intake of 2 microg/kg of L-thyroxine, for 10 days. Thyroid imaging and uptake were then repeated. RESULTS: In the control group [99 mTc] pertechnetate uptake after L-thyroxine suppression had a mean reduction of 75.8 +/- 7.69% (58-87%) in comparison to the baseline level. All subjects were euthyroid by clinical and laboratory criteria and none complained of side-effects, despite significant suppression of TSH levels. In the patient group, thyroid uptake after suppression decreased in 10 patients (maximum reduction 39%), was unchanged in 2 patients and increased in the remaining 8 patients. CONCLUSION: The method described was efficient for demonstration of autonomous thyroid tissue, since none of the patients showed significant reduction of thyroid uptake after L-thyroxine suppression compared with the control group. This test was as effective as the original T3 suppression test, but more convenient to the patient: no side-effects, ease of hormonal intake, low dosimetry and short stay in the nuclear medicine laboratory. Q J Nucl Med. 1999 Sep;43(3):179-87. Scintigraphy with 99mTc-pertechnetate in the evaluation of functional thyroidal autonomy. Meller J, Becker W. Source Department of Nuclear Medicine, Georg August University, Göttingen, Germany. Abstract Iodine deficiency and iodine deficiency disorders are still present in several parts of Europe. Sonography is neither specific in the diagnosis nor sensitive in the evaluation of the amount of autonomous thyroid tissue. Thyroidal autonomy is defined as a functional state of the thyroid and therefore only functional scintigraphic imaging, preferably performed with 99mTc-pertechnetate (99mTcO4-), will offer both high sensitivity and specificity in its diagnosis. Recently the cloning and characterisation of the Na+/I- symporter (NIS) offered a deeper understanding of iodine and pertechnetate uptake in the thyroid gland. Overexpression of the Na+/I- symporter following activation of the adenylate-cyclase-cAMP-cascade has been demonstrated in hot nodules, which gives for the first time an explanation for the enhanced iodine clearance of autonomous thyroidal tissue on a molecular level. The scintigraphic evaluation of thyroidal autonomy is performed both as a quantitative and qualitative thyroid scintigraphy, using a gamma camera fitted with an on-line computer system. A strong and linear correlation between the global 99mTc-pertechnetate thyroid uptake (TCTU) and 123I clearance has been recognised. Therefore TCTU-values can be used as a reliable equivalent of the iodine clearance in the evaluation of actual thyroid function. The clinical value of the TCTU in the diagnosis of thyroidal autonomy is limited because it represents iodine clearance of both normal and autonomous tissue. As a consequence scintigraphic diagnosis and quantification of autonomy can only be established if the global 99mTc-pertechnetate thyroid uptake under suppression (TCTUs) is determined. This method is sensitive in risk stratification of spontaneous or iodine induced hyperthyroidism, in the estimation of the target volume prior to radioiodine therapy independently of its distribution and in the evaluation of therapeutic success after definitive therapy. Eur J Nucl Med Mol Imaging. 2002 Aug;29 Suppl 2:S425-38. Epub 2002 May 15. The continuing importance of thyroid scintigraphy in the era of high-resolution ultrasound. Meller J, Becker W. Source Department of Nuclear Medicine, Georg August University, Robert-Koch-Strasse 40, 37075 Göttingen, Germany. At the molecular level, the uptake of radioiodine and pertechnetate is proportional to the expression of the thyroidal sodium/iodine symporter (NIS). 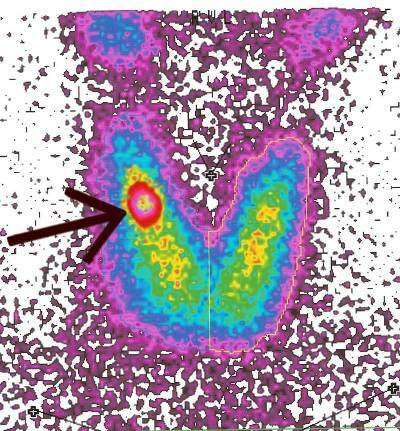 Qualitative and quantitative scintigraphic evaluation of the thyroid is performed with a gamma camera fitted with an on-line computer system and enables determination of the iodine uptake or the technetium uptake (TCTU) as an iodine clearance equivalent. Despite new molecular genetic insights into congenital hypothyroidism, the iodine-123 or pertechnetate scan remains the most accurate test for the detection of ectopic thyroid tissue. Following the identification of specific mutations of the genes coding for the NIS, thyroid peroxidase and pendrin, the discharge test has lost its role in establishing the diagnosis of inherited dyshormonogenesis, but it is still of value in the assessment of defect severity. In PDS mutations the test can be used to establish the diagnosis of syndromic disease. Quantitative pertechnetate scintigraphy is the most sensitive and specific technique for the diagnosis and quantification of thyroid autonomy. The method has proved to be valuable in risk stratification of spontaneous or iodine-induced hyperthyroidism, in the estimation of the target volume prior to radioiodine therapy and in the evaluation of therapeutic success after definitive treatment. In iodine deficiency areas the thyroid scan remains indispensable for the functional characterisation of a thyroid nodule and is still a first-line diagnostic procedure in cases of suspected thyroid malignancy. This is especially of importance in patients with Graves’ disease, among whom a relatively high prevalence of cancer has been found in cold thyroid nodules. While determination of the TCTU is without any value in the differentiation between autoimmune thyroiditis and Graves’ disease in most cases, it is of substantial importance in the differentiation between hyperthyroid autoimmune thyroiditis and Graves’ disease. Exp Clin Endocrinol Diabetes. 1998;106 Suppl 4:S45-51. Scintigraphic evaluation of functional thyroidal autonomy. The scintigraphic evaluation of thyroidal autonomy is performed both as a quantitative and qualitative thyroid scintigraphy with 99m-Tc-pertechnetate (99m-TcO4-), using a gamma camera fitted with an on-line computer system. A strong and linear correlation between the global 99m-Tc-pertechnetate thyroid uptake (TCTU) and I-123 clearance has been recognised. Therefore TCTU-values can be used as an reliable equivalent of the iodine clearance in the evaluation of actual thyroid function. The clinical value of the TCTU in the diagnosis of thyroidal autonomy is limited because it represents iodine clearance of both normal and autonomous tissue. As a consequence scintigraphic diagnosis and quantification of autonomy can only be established if the global 99m-Tc-pertechnetate thyroid uptake under suppression (TCTUs) is determined. This method is valuable in risk stratification of spontaneous or iodine induced hyperthyroidism, in the estimation of the target volume prior to radioiodine therapy and in the evaluation of therapeutic success after definitive therapy. Eur J Endocrinol. 1996 Mar;134(3):337-41. Prophylactic application of thyrostatic drugs during excessive iodine exposure in euthyroid patients with thyroid autonomy: a randomized study. In a prospective, randomized study we examined the influence of prophylactic short-term thyrostatic therapy on thyroid iodine metabolism in patients with euthyroid autonomy undergoing elective coronary angiography. From a total of 1177 patients, 51 fulfilled the criteria of euthyroid autonomy before coronary angiography (negative thyrotropin-releasing hormone test, 10-min uptake of at least 1.2%, 99mTc and no elevation of free thyroxine and free triiodothyronine indices) and were randomized into three groups: group 1 (N = 17) received 20mg/day of thiamazole and group 2 (N = 17) received 900 mg/day of sodium perchlorate; thyrostatic therapy was begun on the day before angiography and continued for 14 days; group 3 (N = 17) served as controls without treatment. Parameters of thyroid function-free thyroxine (FT4) index and free triiodothyronine (FT3) index, thyrotropin (TSH) and delta-TSH urine iodine excretion and 99mTc uptake were determined before and 30 days after coronary angiography. At the end of the study the mean FT4 index and FT3 index were elevated significantly in the control group compared with baseline values, but were still within the normal range. In contrast, the mean FT4 index and FT3 index remained unchanged in the treated groups. Four mild cases of hyperthyroidism were observed at the end of the study: two cases in the control group and one case in each of the treated groups. Thyrotropin suppression, urine iodine excretion and 99mTc uptake differed significantly between the treated groups and the control group. In the treated groups TSH suppression, urine iodine excretion and 99mTC uptake remained unchanged 30 days after coronary angiography compared with baseline values. In the control group the degree of TSH suppression and the level of urine iodine excretion increased (about twofold) significantly after coronary angiography, whereas 99mTc uptake decreased significantly (ca. 50%). In conclusion, short-term prophylactic thyrostatic therapy seems to have a protective effect against iodine excess in patients with euthyroid autonomy. However, mild hyperthyroidism could not be prevented in some cases. Probably a combination therapy of thiamazole and perchlorate would be more effective. [Risk of hyperthyroidism in examinations with contrast media]. Investigations with contrast media inevitably lead to the patient being exposed to large amounts of iodine. Under certain preconditions this entails danger for the patient by causing either iodine-induced hyperthyroidism, which is difficult to treat, or even a thyrotoxic crisis. Patients with normal thyroid function and size have only minute changes of thyroid hormones and TSH within the normal range and are not at risk. Patients with unknown hyperthyroidism–independent of the etiological form–and patients with functional autonomy are at risk of exacerbation of pre-existing hyperthyroidism or development of iodine-induced hyperthyroidism. This development depends on two factors: a) the volume of autonomous tissue and b) the quantity of iodine exposure. Besides contrast media, other sources of iodine excess are possible, such as iodine-containing disinfectants, secretolytic agents, antiarrhythmics like amiodarone, eye drops and ointments, geriatrics, skin ointments, toothpaste etc. The development of hyperthyroidism can be prevented by combined treatment with antithyroid drugs and perchlorate in the case of preexisting hyperthyroidism or the urgent clinical suspicion of thyrotoxicosis or with perchlorate alone, when the patients is euthyroid and does not have a large nodular goitre. Clin Endocrinol (Oxf). 1993 Jul;39(1):67-71. Prevalence of subclinical hyperthyroidism and relationship between thyroid hormonal status and thyroid ultrasonographic parameters in patients with non-toxic nodular goitre. Rieu M, Bekka S, Sambor B, Berrod JL, Fombeur JP. Source Department of Endocrinology, Saint-Michel Hospital, Paris, France. Abstract OBJECTIVE: Basal plasma T4, T3 and TSH concentrations are usually normal in patients presenting with non-toxic nodular goitre. Using the evaluation of TSH response to TRH in a large series of such patients living in an area with normal iodine intake, we evaluated the prevalence of subclinical hyperthyroidism and the relationship between thyroid hormonal status and ultrasonographic parameters. PATIENTS: A prospective study of 242 consecutive patients (group I), referred with non-autoimmune nodular goitre, normal plasma free T4, total T3 and TSH levels, without (subgroup IA, 222 patients) or with (subgroup IB, 20 patients) clear-cut autonomous area(s) on scintigraphy. These patients were compared to 135 controls (group II). MEASUREMENTS: Plasma free T4 (FT4), total T3 (T3T) and TSH measurements. Evaluation of TSH response to TRH (delta level of increased TSH = peak TSH level during TRH test-basal TSH level), thyroid scintigraphy and morphological characteristics (number and total volume of nodule(s) and volume of extranodular tissue) determined by ultrasonography. RESULTS: In subgroup IA, (1) the mean (+/- SEM) basal TSH level (0.94 +/- 0.04 mU/I) and the mean value of increased TSH after TRH (4.92 +/- 0.34 mU/I) were lower (P < 0.001) than in group II (1.28 +/- 0.05 mU/I and 7.24 +/- 0.25 mU/I, respectively). The prevalence of SH (delta level of increased TSH below the mean -3 SD in controls) was 17.2%; (2) the mean FT4 level and the mean T3T value were not different (P > 0.05) from those of group II. In subgroup IB, (1) the mean basal TSH level (0.57 +/- 0.11 mU/I) and the mean increment of TSH after TRH (2.81 +/- 0.62 mU/I) were lower (P < 0.001) than in subgroup IA. The prevalence of subclinical hyperthyroidism was 75.0%; (2) the mean FT4 level (17.2 +/- 0.9 pmol/I) was not different from that in group II. However, the mean T3T value (1.99 +/- 0.01 nmol/I) was higher (P < 0.001) than in group II (1.65 +/- 0.05). In group I, subgroup IA and IB, there were significant (P < 0.05, at least) correlations between the numbers of nodules and both basal TSH levels and delta values of increased TSH or FT4 levels or T3T values. No correlations were found between other ultrasonographic data and plasma thyroid parameters. CONCLUSIONS: This study demonstrates a high prevalence of subclinical hyperthyroidism in patients presenting with non-toxic nodular goitres and suggests that the number of nodules, but not their total volume, is an important factor in the development of this condition. Acta Endocrinol (Copenh). 1980 Jul;94(3):332-6. Iodine induced thyrotoxicosis in apparently normal thyroid glands. Skare S, Frey HM. Two male patients aged 36 and 52 years with thyrotoxicosis revealed a serum T3 of 2.8 and 6.5 nmol/l and a serum T4 of 166 and 238 nmol/l, respectively. Both had been exposed to iodine (2-10 mg daily) for 2-12 months before thyrotoxicosis was diagnosed. Urinary iodine excretion was high, 5000 and 10,000 nmol/24 h (624-1250 microgram). The uptake of 131I in the thyroid glands were low, none had goitre. Their iodine intake was interrupted, urinary iodine excretion gradually decreased, and T3 and T4 in serum concomitantly normalized. They were clinically and biochemically euthyroid 9 and 11 weeks after withdrawal. After 14 and 22 weeks they had normal thyroid uptake of 131I, and thyroid scans showed glands of normal size and configuration. TRH-stimulation and a T3-suppression tests became normal. ESR was not elevated in any of the cases, thyroid antibodies against thyroglobulin and follicular cell microsomes were absent and TSAb was undetectable durng the thyrotoxic stage. Thus no evidence of any pre-existing and/or pre-disposing pathological condition in the thyroid glands were found. The mechanism for the iodine-induced thyrotoxicosis in such cases remains obscure. KNUT KROHN AND RALF PASCHKE Third Medical Department (K.K., R.P.) and Interdisciplinary Somatic TSH receptor (TSHR) mutations have been discovered as the most prevalent molecular event in the etiology of autonomously functioning thyroid nodules (6). Clin Endocrinol (Oxf). 1984 Dec;21(6):631-7. Transient thyrotoxicosis in endemic goitre patients following exposure to a normal iodine intake. Lima N, Medeiros-Neto G.
Twenty-three endemic goitrous subjects (goitre grade: III and IV) that were living in a chronic iodine-deficient area (iodine intake: less than 40 micrograms I/d) were submitted to clinical and laboratory evaluation within 3-8 weeks of arrival at the metropolitan area of São Paulo, where daily iodine intake is estimated to be 150-200 micrograms I/d. Eight patients developed a mild thyrotoxic state (T4 = 14.7 +/- 2.3 micrograms/dl, T3 = 279 +/- 55 ng/dl, no TSH response to TRH). Five additional subjects, although euthyroid, had a blunted TSH-response to TRH, and the remaining ten patients were euthyroid and had a normal TSH response to TRH. Thyrotoxicosis was associated with larger goitres (mean thyroid weight: 133 +/- 46 g), with high thyroid uptake of RAI (mean 24 h 131I uptake: 40 +/- 15%) but not with increased urinary iodine excretion. Serum Tg levels were more elevated in the first two groups of patients (respectively, geometric means 68 and 72 ng/ml), than in the euthyroid, TRH-responsive group (52 ng/ml). Thyrotoxicosis resolved spontaneously after three to six months without the need for any specific medication. It was concluded that a relatively small and normal iodide intake due to regular consumption of iodized salt and industrialized foods may induce a transient form of thyrotoxicosis in endemic goitre patients arriving into urban areas. 38) www.ncbi.nlm.nih.gov/pubmed/9059552 Clin Endocrinol (Oxf). 1997 Jan;46(1):9-15. Five-year follow-up of percutaneous ethanol injection for the treatment of hyperfunctioning thyroid nodules: a study of 117 patients. Percutaneous ethanol injection (PEI) has been suggested as an alternative to radioiodine and surgery for the treatment of autonomous thyroid nodules (ATN). OBJECTIVE: In this study we have defined the long-term efficacy and safety of PEI for the treatment of ATN, and we have attempted to optimize the clinical usefulness and improve the technical approach to PEI treatment. PATIENTS: One hundred and seventeen patients with ATN, 26 males and 91 females, aged 48 +/- 12.9 years (mean +/- SD), were offered PEI when other established treatments were refused or contraindicated. Seventy-seven patients were affected by toxic adenoma (60 with a single nodule, 17 with a multinodular goitre); 40 patients suffered from a pretoxic single nodule. METHODS: Sterile 95% ethanol was administered weekly under sonographic control by a 20-22 gauge needle without anaesthesia or pharmacological sedation. During PEI treatment, 26 toxic elderly patients were treated with methimazole and propranolol. According to hormone and scintigraphic data, three possible outcomes were identified for statistical analysis: failure (persistent suppression of extra-nodular tissue uptake, along with elevated free T4 (FT4) and free T3 (FT3) and undetectable TSH levels); partial cure (normalization of FT4 and FT3 levels, with low/ undetectable TSH levels; persistent suppression of extra-nodular uptake); complete cure (normal thyroid hormone and TSH levels; restored extra-nodular uptake). RESULTS: The patients were followed for up to 5 years (median 2.5). PEI therapy was well tolerated by all patients. Complete cure was achieved in all pretoxic patients and in 60 (77.9%) patients with toxic adenoma, while partial cure was observed in 7 cases (9.1%) and failure in 10 (13%). PEI treatment proved similarly effective in toxic patients with a single nodule or with multinodular goitre (87 vs 88.2%, respectively). At the end of treatment, a significant shrinkage of nodule volume was observed in all patients (P = 0.0001). Toxic patients with pretreatment volume > 40 ml (n = 8) did not show a significant difference in treatment response rate as compared to those with volume < 40 ml. Recurrence of hyperthyroidism was never observed during follow-up, independently of thyroid status before treatment. Only one patient with significant thyroid autoantibody serum levels before PEI treatment, developed sub-clinical hypothyroidism at 3 years. The administration of methimazole and/or propranolol did not modify PEI outcome. J Clin Endocrinol Metab. 1996 Sep;81(9):3261-4. Percutaneous intranodular ethanol injection (PEI) has been proposed for the therapy of autonomously functioning thyroid nodules. In 1992, an Italian multicenter study was undertaken to confirm the usefulness and the feasibility of this procedure. The study included 429 patients: 242 (56.4%) were affected by a toxic adenoma (TA) and 187 (43.5%) by pretoxic adenoma (PTA). Free thyroid hormone levels (FT4, FT3) and thyroid stimulating hormone (TSH) were measured before and 3, 6, 12 months after the end of treatment; thyroid ultrasound and thyroid scintiscan were performed in the majority of patients before and after treatment. Patients underwent 2-12 sessions of ethanol injection under sonographic guidance (median 4). The total amount of ethanol administered per patient (1.5 mL/mL nodular volume) was 2-50 mL (mean +/- SD, 17 +/- 9 mL), and the amount per each injection was 1-8 mL (3.2 +/- 1.3 mL). The treatment was judged successful when both TSH and free thyroid hormone serum levels returned within the normal range and recovery of tracer uptake in extranodular tissue was observed at scintiscan, at any time during the follow-up period. The treatment was considered unsuccessful when no change was observed at scintiscan and/or serum TSH levels remained less than 0.4 mU/L. A successful treatment was achieved in 66.5% of patients with TA and in 83.4% of patients with PTA, when assessed after a 12-month follow-up. In all cases a reduction of the nodular size was observed. Almost all positive results were obtained in nodules whose initial volume was less than 15 mL; large nodules responded less favorably. The treatment was generally well tolerated, only transient side-effects, mainly local pain at the time of injection, were observed. Once normalization of scintigraphic image and of FT4, FT3 and TSH serum concentrations was achieved, no recurrence of hyperthyroidism nor development of hypothyroidism were observed for the length of the study. In conclusion, percutaneous ethanol injection for treatment of autonomously functioning thyroid nodules is effective and safe. Better results are obtained in patients with PTA than in patients with TA, particularly when the initial volume of the nodule is less than or equal to 15 mL. PEI may be considered as an alternative to surgery and to radioiodine for treatment of autonomously functioning thyroid nodules. Environ Health Perspect. 1999 October; 107(Suppl 5): 749–752. Linking iodine with autoimmune thyroiditis. N R Rose, L Rasooly, A M Saboori, and C L Burek Department of Molecular Microbiology and Immunology, The Johns Hopkins Medical Institutions, Baltimore, MD 21205, USA. A great deal of circumstantial evidence has linked iodine with the rising incidence of autoimmune thyroiditis in the United States. In our investigations, we have shown directly that T cells from humans with chronic lymphocytic thyroiditis proliferate in the presence of iodinated but not in the presence of noniodinated human thyroglobulin. Moreover, the proliferative response is restored when the thyroglobulin is iodinated artificially in vitro. Using a panel of monoclonal antibodies, we found evidence that the presence of iodine induces a number of stereochemical changes in the conformation of the molecule, resulting in the loss of some antigenic determinants and the appearance of others. One prominent determinant was associated with the iodine-containing amino acid thyroxine. Both the number and position of the iodine substituents determine the precise specificity of this epitope. A new model for the study of the role of iodine in inducing thyroid autoimmunity has become available in the form of the nonobese diabetic (NOD)-H2(h4) mouse. This animal develops autoimmune thyroiditis spontaneously but in relatively low prevalence. However, if iodine is added to the drinking water, the prevalence and severity of the thyroid lesions increase markedly. The immune response is specific for thyroglobulin, both in terms of the antibody response and T-cell proliferation. In fact, the appearance of lesions can be predicted by the presence of thyroglobulin-specific IgG2b antibody. The disease, moreover, can be transferred adoptively, using spleen cells from iodine-fed donors treated in vitro with iodinated thyroglobulin. The effects of iodine feeding are greater in conventional animals compared with those maintained under specific pathogen-free conditions. Based on T-cell proliferation, it appears that the NOD-H2(h4) strain of mice has innately a greater response to murine thyroglobulin than do other mouse strains and that the proliferation is increased even more by feeding iodine. We suggest, therefore, that the presence of iodine increases the autoantigenic potency of thyroglobulin, a major pathogenic antigen in the induction of autoimmune thyroiditis. This animal model provides a unique opportunity for investigating in detail the mechanisms by which an environmental agent can trigger a pathogenic autoimmune response in a susceptible host. Endocr J. 2010;57(7):595-601. Epub 2010 Apr 27. Selenium upregulates CD4(+)CD25(+) regulatory T cells in iodine-induced autoimmune thyroiditis model of NOD.H-2(h4) mice. Xue H, Wang W, Li Y, Shan Z, Li Y, Teng X, Gao Y, Fan C, Teng W. Source Department of Endocrinology and Metabolism, Institute of Endocrinology, First Affiliated Hospital, China Medical University, Shenyang, China. Abstract Selenium (Se) is required for thyroid hormone synthesis and metabolism. Se treatment reduces serum thyroidspecific antibody titers in patients with autoimmune thyroiditis (AIT), but the exact mechanism is not clear. We investigated the effects of Se treatment on CD4(+)CD25(+)Foxp3(+) regulatory T cells (Treg) in a iodine-induced autoimmune thyroiditis model. NOD.H-2(h4) mice were randomly divided into control, AIT untreated, and AIT with Se treatment groups. Mice were fed with 0.005% sodium iodine (NaI) water for 8 weeks to induce AIT. Se-treated mice received 0.3 mg/L sodium selenite in drinking water. The AIT mice had fewer Treg cells and reduced Foxp3 mRNA expression in splenocytes compared with the controls (p < 0.01). The percentage of Treg cells and expression of Foxp3 mRNA were increased by Se treatment (as compared with untreated AIT mice, p < 0.05). Mice that received Se supplementation also had lower serum thyroglobulin antibody (TgAb) titers and reduced lymphocytic infiltration in thyroids than untreated AIT mice. These data suggest that CD4(+)CD25(+) T cells play an important role in the development of AIT. Se supplementation may restore normal levels of CD4(+)CD25(+) T cells by up-regulating the expression of Foxp3 mRNA in mice with AIT. Fumarola, A., Di Fiore, A., Dainelli, M., Grani, G., & Calvanese, A. (2010). Medical treatment of hyperthyroidism: state of the art. Experimental and clinical endocrinology & diabetes, 118(10), 678. Płazińska, Maria Teresa, Leszek Królicki, and Marianna Bąk. “Lithium carbonate pre-treatment in 131-I therapy of hyperthyroidism.” Nuclear Medicine Review 14.1 (2011): 3-8. Ann Intern Med. 1984 Oct;101(4):488-90. Successful treatment of solitary toxic thyroid nodules with relatively low-dose iodine-131, with low prevalence of hypothyroidism. Ross DS, Ridgway EC, Daniels GH. Forty-five patients with solitary toxic thyroid adenomas received 131I (mean dose, 10.3 mCi) for treatment of hyperthyroidism and were followed for 4.9 +/- 3.2 years (range, 0.5 to 13.5). Seventy-seven percent were euthyroid by 2 months, 91% by 6 months, and 93% by 1 year. Only 3 patients did not respond to a single dose of 131I, but all responded to multiple doses. Late recurrent hyperthyroidism occurred in 3 patients at 4.5, 6, and 10 years after treatment with a single dose of 131I. No patient developed clinical hypothyroidism, and none had a low serum thyroxine level associated with an elevated serum thyrotrophin level. Three patients developed minimal elevations in serum thyrotrophin levels: 1, 4, and 7.5 years after 131I treatment, their thyrotrophin levels were 8.4, 6.2, and 9.6 microU/mL, respectively. All 3 had normal serum thyroxine levels and were clinically euthyroid. Mean serum thyroxine concentrations of all patients were unchanged between 1 and more than 9 years of follow-up. These data suggest that solitary toxic adenomas may be treated with relatively low doses of 131I (5 to 15 mCi), and that post-treatment hypothyroidism is very unusual. J Nucl Med. 1991 Jan;32(1):27-30. Long-term follow-up in toxic solitary autonomous thyroid nodules treated with radioactive iodine. Huysmans DA1, Corstens FH, Kloppenborg PW. The long-term effects of radioiodine treatment on thyroid function in patients with a toxic solitary autonomous thyroid nodule were evaluated. Fifty-two patients received a therapeutic dose of 20 mCi of iodine-131 (131I). Duration of follow-up was 10 +/- 4 yr. Follow-up data included a biochemical evaluation of thyroid function. The failure rate (recurrent hyperthyroidism) was 2%. The incidence of hypothyroidism was 6% and was not related to the dose per gram of nodular tissue. Oral administration of 20 mCi of radioiodine is a simple and highly effective method for the treatment of patients with a toxic autonomous thyroid nodule. The risk of development of hypothyroidism is low if extranodular uptake of 131I is prevented. This can be achieved by not treating euthyroid patients, by no longer using injections of exogenous thyroid stimulating hormone in the diagnostic work-up of the patients and by always performing radioiodine imaging shortly before treatment. Copyright (c) 2011-2013 Jeffrey Dach MD All Rights Reserved. This article may be reproduced on the internet without permission, provided there is a link to this page and proper credit is given.